The number of religious believers in China could be three times higher than official estimates, according to a survey reported by state media. A poll of 4,500 people by Shanghai university professors found 31.4% of people above the age of 16 considered themselves as religious. This suggests 300 million people nationwide could be religious, compared to the official figure of 100 million. 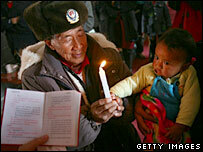 China is regularly criticised for cracking down on unauthorised worship. Believers are only allowed to attend government-approved churches, mosques and temples. Correspondents say the poll's findings back up suspicions that religion has been enjoying a resurgence in China over the past 20 years, as Communist Party disapproval has eased. But the party is still ready to deal harshly with any religious group it perceives to be a challenge to its authority - especially the banned spiritual movement Falun Gong, which was not mentioned in the reports. The poll was carried out by professors at the East China Normal University in Shanghai. Their methodology was not made clear in the state media reports, neither was it clear whether people are becoming religious, or becoming more prepared to say so. But the official China Daily called their work the "country's first major survey on religious beliefs". The survey found that Buddhism, Taoism, Catholicism, Christianity and Islam are the country's five major religions - China considers Catholicism as separate to Christianity, which covers Protestantism. About 200 million believers "are Buddhists, Taoists or worshippers of legendary figures such as the Dragon King and God of Fortune", the China Daily reported. The survey also found a significant rise in Christianity - accounting for 12% of all believers, or 40 million, compared with the official figure of 16 million in 2005. Professor Liu Zhongyu, who helped carry out the survey, attributed the rise in religious belief to growing freedoms in the country as well as the upheaval of rapid social and economic change. He said the average age of religious believers had fallen, with two-thirds of those in the poll who considered themselves religious aged between 16 and 39. "This is markedly different from the previous decade, when most religious believers were in their 40s or older," he said in the Chinese-language Oriental Outlook magazine, which published the survey.